Produce a version of Python at least 5x faster than CPython. We discussed some details with Collin Winter, Jeffrey Yasskin and Thomas Wouters during the VM summit yesterday. We were a bit confused about usage of the term JIT, because as far as we understood, it's going to be upfront compilation into LLVM. In the past we have looked into LLVM – at one point PyPy extensively use it but it wasn't clear how we could make good use to it. They also consider changing to something else than LLVM. It's gonna be interesting to see how this works out. The idea of the VM summit here in Chicago was to bring together implementors of various virtual machine languages. There were members of the communities of IronPython, CPython, GemStone's MagLev, Rubinius, Mozilla's TraceMonkey, Parrot, Sun's Da Vinci Machine, Microsoft's DLR, Jython and JRuby. Everybody got to talk 5-10 minutes on their current status and challenges. It is clear that you cannot begin to cover the complexities and architectures of the involved projects. But that wasn't too much of a problem because the rest of the day everybody freely and dynamically grouped on their issues of choice. We established some more personal contacts, was great to chat with people like Andreas Gal from the University of California, Irvine, who have a very similar idea about the JIT that we have. Actually, we could probably haved mixed our two presentations and nobody would have actually noticed :-). At the end of the presentation part, John Rose presented his slides. John is a Hotspot developer, and while not precisely a dynamic language implementor, he has a lot of experience in virtual machine implementation. It's very good to see the JVM being extended towards supporting dynamic-language specific things, in order to be something more than just a good platform for Java. We'll probably have some extra meetup with him the next days. Yesterday i gave my PyPy status/mobile perspectives at OpenBossa, Nokia's developer conference for embedded platforms in Brazil. Found it a bit of a tough task to do that in 50 minutes. I had some 50, later more developers attending the talk and was happy with the questions and the feedback. Guess it's a good sign if the number of people grows during a talk :) It was the first time i tried to work more with pictures and actually used some devianart photos from Marikaz to mark section transitions. I summarize/highlight some key points here in the post. After intro and 2.5 compatibility status, i talked about our measurements of PyPy's Python on Nokia's N810 internet tablet. The best bit is that for almost all Python data structures PyPy has smaller memory representations than CPython. Particularly good are class instances which often score at 50% of CPython's sizes. Startup time is also often better and can be improved. On the bad side, PyPy's quite large base interpreter size and its bytecode execution is often worse. In the talk i also outline ideas for "perfect PYC files" for minimizing module import times and maximizing sharing across interpreter processes. I also briefly discussed the PyPy situation with extension modules and regarding C++ libs. Most of these ideas arose from sprint discussions last year. In the morning i also had some good talk with Stefan Seefeld about Boost Python and the new QT4 bindings. Maybe to use Boost Python is also a good opportunity - but PyPy does not currently have a C-level or C++ level API. I think our upcoming 1.1 release will be a good point in time for many people to look some more into PyPy. I hope we are crossing the chasm soon. It's been a while since the project started :) Getting some more sponsoring to sustain and increase our current efforts probably wouldn't hurt. If you are interested in some more not so pypy-specific bits about the conference and what i experienced, you might head over to my tetamap blog. our JIT is about 20x faster than CPython. That's still about 3x slower than Psyco, but looking at assembler code it's obvious that we can speed it up a lot. These are very good news, since we don't encode python semantics at all in the JIT. The JIT is automatically generated from the Python interpreter source code. This means we should be able to expand it to handle more complex python programs relatively quickly (interested assembler experts needed!). This is actually the fifth incarnation of JIT that happened over the last two years. It's by far simpler and more promising than any of the previous approaches. Expect more details soon! The previous post about our JIT explained a bit from the 1000 km perspective how the tracing JIT would approach a language like Python. I would like to step a bit inside and give a zoom to some of its features that are already working. While probably not the most innovative, I think it's very nice to look at the way we work with the JIT and what tools we use. The main cool thing is that you can work on and try the JIT (including trying it on the Python interpreter!) without even generating a single bit of assembler. How? Let's start with something very simple. Let's take a simple interpreter for language X. All very simple code, expect the jitdriver hints, which instruct JIT how to behave (they are the equivalent of the ``add_to_position_key`` of last the blog post). This is the call graph of an interpreter loop, nothing magic so far. This is an intermediate representation of translation toolchain input. If you look around you can follow how the opcodes are dispatched (with a chain of ifs) and helpers called. Next graph is very boring, because it's a bit lower level representation of the same thing (you exit with q or escape btw :). It's entering JIT, doing some primitive operations for bytecode dispatching and repeating the loop. Note that at the end of the interpreted loop (not to be confused with the interpreter loop), we see int_sub [3, 3] which resets the bytecode position to the beginning. At this time JIT (instructed by can_enter_jit hint) notices that all green variables are the same (here only i), hence we can compile the efficient loop from this point. The loop contains 3 additions and a check (for i < 100), exactly the same as our interpreted program would do, but completely without interpretation overhead! As you might have noticed, there is no assembler involved so far. All of this instruction execution is done directly, in pure python. In fact, the code for executing instructions is located in jit/backend/llgraph which directly interprets instructions. This is by far simpler (and easier to debug) than x86 assembler. And this is basically it: the very simple interpreter and a jit for it. Of course we actually can generate assembler for that. Also the missing piece is optimizing the generated graphs. While for this example, by removing the interpretetation overhead, we're done, with more complex examples it's important to further optimize traces. Hopefully this and how we actually generate assembler will be topics for next blog posts. Next week i am going to give a talk on PyPy at OpenBossa, a developer conference on embedded platforms. I've written up a bit more of my background and why i find it very interesting to go there on my blog. Probably will mostly follow up there or on twitter and not much here on the PyPy blog because it's not all about PyPy. To summarize how i see it: i think there is great potential for Python and PyPy on mobiles and am thrilled to hear about what's going on currently and to discuss opportunities. After I had failed once more to explain to someone on IRC what the idea behind the current JIT generator work of PyPy, I decided to just write a blog post to explain it. Here it is :-). The post turned out to be a bit long, so please bear with me. The goal of the post is to give an understanding of how PyPy's JIT generator is going to work. To do this, I will look at what happens when you write an interpreter in Java and apply a completely normal tracing JIT to it (for this reason all the code examples will be in some sort of pseudo-Java). The resulting generated machine code is bad, so I will explain a way to fix the occurring problem. The techniques I describe here are conceptually similar to what we are doing in PyPy. The details (as usual) are different. The reasons why I am trying to explain things in this way is that I can start from tracing JITs, which are a known existing technique. To understand the following, it is helpful to already know a bit how a normal tracing JIT works. I will give a reminder of how it is working, but there also exist a couple of more thorough introductions on the web already. I also will leave out a lot of details about the more detailed workings of tracing JITs and only explain the things that are relevant to what I am trying to get to here. The basic approach of a tracing JIT is to only generate machine code for commonly executed loops and to interpret the rest of the program. The code for those common loops however should be highly optimized, including aggressive inlining. The generation of loops works as follows: At first, everything is interpreted. 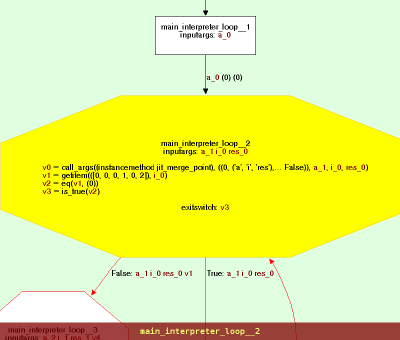 The interpreter does a bit of lightweight profiling to figure out which loops are run often. 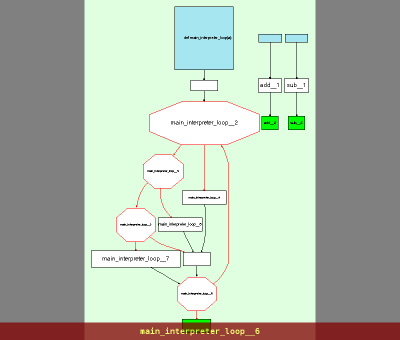 When a common loop is identified, the interpreter enters a special mode (called tracing mode). When in tracing mode, the interpreter records a history (the trace) of all the operations it executes, in addition to actually performing the operations. During tracing, the trace is repeatedly checked whether the interpreter is at a position in the program that it had seen earlier in the trace. If this happens, the trace recorded corresponds to a loop in the program that the tracing interpreter is running. At this point, this loop is turned into machine code by taking the trace and making machine code versions of all the operations in it. This process assumes that the path through the loop that was traced is a "typical" example of possible paths (which is statistically likely). Of course it is possible that later another path through the loop is taken, therefore the machine code will contain guards, which check that the path is still the same. If during execution of the machine code a guard fails, the machine code is left and execution falls back to using interpretation (there are more complex mechanisms in place to still produce more code for the cases of guard failures, but they are of no importance for this post). It is important to understand when the tracer considers a loop in the trace to be closed. This happens when the position key is the same as at an earlier point. The position key describes the position of the execution of the program, e.g. usually contains things like the function currently being executed and the program counter position of the tracing interpreter. This trace will then be turned into machine code. Note that the machine code loop is by itself infinite and can only be left via a guard failure. This would then be turned into machine code. Note how f was inlined into the loop and how the common else case was turned into machine code, while the other one is implemented via a guard failure. In the rest of the post we will explore what happens when the program that is being executed/compiled by the tracing JIT is itself a (bytecode) interpreter for another language. If we apply a tracing JIT to this function, it will trace and compile the execution of one bytecode, because after one bytecode the bytecode dispatch loop is closed. E.g. it might trace and produce machine code for the execution of a SUB. (Sidenote: this interpret function is an example where one of the assumptions of a tracing JIT break down: two iterations of the bytecode dispatch loop are rarely going to follow the same code path, because usually two consecutive bytecodes encode different instructions). The important bit to remember here is that the tracing JIT will produce a machine code loop that corresponds to the bytecode dispatch loop in the interpret function. Let's see how we can change that. If we want to make use of the fact that the program that is being jitted is itself an interpreter, we need to change the tracing JIT a bit. To be more precise we add a way for the user of the tracing JIT to add information to the position key that the tracing JIT uses to decide when a loop is closed. This is done by a call to a magic function add_to_position_key. This allows the program writer to influence the tracing JIT's behaviour. The semantics of add_to_position_key is as follows: The method itself does not do anything. It has an effect only when it is seen during tracing. If it is seen during tracing, the tracer adds the argument of the call to the position key that the tracer is using to find out whether a loop was closed or not. When the modified tracing JIT traces now the interpret function executing a SUB, something interesting happens. When the bytecode loop is closed, the modified tracing JIT does not consider the trace to be a loop, because the value of pc has been increased by one, so the position key differs. Instead it continues to trace, effectively unrolling the bytecode dispatch loop of interpret. The only way for a loop to be considered closed is if the pc variable has the same value a second time. This can only happen after a JUMP_BACKWARD instruction has been executed. 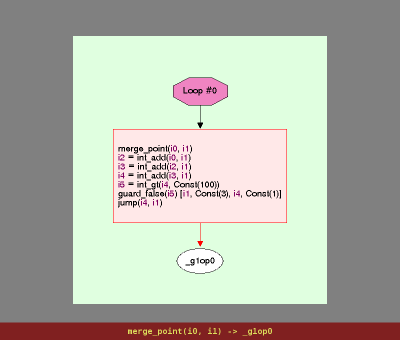 A JUMP_BACKWARD instruction will only be in the bytecode when the bytecode represents a loop. This means that the modified tracing JIT will trace the interpret function and will only consider that the trace represents a loop when the bytecode itself represents a loop! Thus, a machine code loop will eventually be created that corresponds to the loop in the bytecode. This is machine code that essentially does what the bytecode above did. Of course the code still remains some remnants of the interpreter (like the program counter manipulations, the stack handling, etc), which would have to be removed by some clever enough optimization step. If this were done, result would look a lot more natural. If a tracing JIT is enhanced by a way to influence its loop-closing behaviour we can significantly improve its performance when the jitted program is itself an interpreter. The result is that in such a case the produced machine code will correspond to the functions that are being interpreted, not to the code of the interpreter itself. Now, what does all this have to do with PyPy? What we are working on since a while is a sort of tracing JIT for RPython which allows to be customized with a function very similar to the add_to_position_key described above. This will make it possible to make the tracing JIT generate code that corresponds to the code that the interpreter interprets. For example, we would add a call to add_to_position_key to SPy, PyPy's Smalltalk VM. Then the tracing JIT will produce machine code for Smalltalk-level loops, with all the usual benefits of a tracing JIT (like inlining of intermediate methods, constant-folding, ...). This JIT differs from normal tracing JITs in that it also supports very powerful constant-folding and allocation-removal optimizations. Those optimizations will (hopefully) be the content of a later blog post. The basics of this process have been working fine since quite a while. What the work currently focuses on is to improve the optimizers to remove not only the bytecode manipulation code, but also the stack handling, and a large number of other inefficiencies. The next PyPy sprint will be in Leysin, Switzerland, for the sixth time. This sprint will take place immediately after Easter. This is a fully public sprint: newcomers and topics other than those proposed below are welcome. The overall idea of the sprint is to continue working on making PyPy ready for general use. There are a few tasks left in there. In parallel, we will continue the work on the JIT, if there is general interest. And as usual, we are ready to add any other task -- please mention on the mailing list what you would like to work on; the list of task is not really fixed. For more information see the announcement.